The gravel crunches under our boots as we hoof it up the relentless grade of Forest Road 80, a reconditioned logging road that switchbacks its way up the western slope of Cabin Mountain in West Virginia’s Canaan Valley. The morning sun, already bright through the leafless forest canopy, appears even brighter as it reflects off lingering pockets of snow on the brown forest floor. Two cars full of hikers on their way to Dolly Sods come lumbering up behind us, causing our group of nearly 50 volunteers to part like the Red Sea. The driver of the first car rolls down the window and asks what the hell we’re doing. “We’re planting red spruce trees, would you like to join us?” replies Dawn Washington, our crew leader and wildlife biologist at the Canaan Valley Wildlife Refuge. The hikers respectfully decline, offer some kudos, and continue on their way up the road. We eventually reach two U.S. Fish and Wildlife Service trucks, the beds loaded with metal planting bars called dibbles and grocery bags full of spruce seedlings—3,500 to be exact. Dawn gives us a crash course on how to plant a spruce seedling: stab out a hole with the dibble, drop the seedling in the hole, fill in the air space around the plug, and pack the area around the shoot with the remaining soil and organic material. According to Washington, these seedlings have an astounding success rate of around 90%—a rarity in the world of volunteer-driven restoration—meaning that, hopefully, around 3,100 of these seedlings will get to work on transforming this portion of Cabin Mountain back to its original form. She instructs us to work in groups of two and to try our best to space all the seedlings around 10-feet apart. My girlfriend, Nikki, and I grab our materials and start planting our way up the steep slope of Cabin Mountain. As we pop seedling after seedling into the ground, I start to imagine what this area could look like in 10, 20, 50 years. Taking a breather, I notice the prominent stand of red spruce atop a knob floating in the distance like a vibrant green island in an undulating sea of grey—that’s what this entire area should look like. The red spruce ecosystem once covered over one million acres of the West Virginia highlands, but the clearcutting spree of the early 20th century reduced that once-vast forest to just around 50,000 acres—five percent. Today, only 30,000 acres remain. Gone with the sprawling forest are crucial wildlife corridors, natural temperature controls for cold water fisheries, and one of the greatest natural carbon sequestrations on the continent. But a dedicated and growing movement is looking to change that. 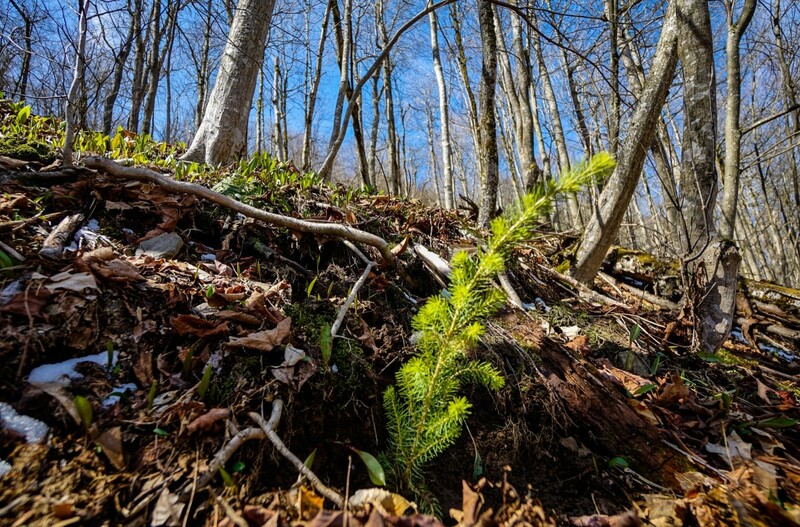 Spearheaded by the Central Appalachian Spruce Restoration Initiative (CASRI), staffed with volunteers from a variety of NGOs like the West Virginia Highlands Conservancy, and supported by government agencies like the U.S. Fish and and Wildlife Service and U. S. Forest Service, the era of cooperative red spruce ecosystem restoration is underway. Nowadays, Saville works with volunteers on the arduous and tedious task of gathering red spruce cones from red squirrel caches, drying and tumbling the cones to remove the seeds, and shipping the seeds to be expertly sprouted by commercial tree growers in the Pacific Northwest. The seedlings, which cost one dollar a piece, are frozen and shipped back to West Virginia, where they must be thawed prior to planting. Red spruce restoration has now been ongoing for nearly 16 years. According to Washington, who has been involved since the start, 97,139 spruce and fir trees have been planted over 630 acres in the Canaan Valley Wildlife Refuge. She was quick to place the limelight back on Saville. According to CASRI, 63,670 red spruce seedlings and 53,700 native plants were planted on more than 150 acres of high-elevation lands in 2018, bringing the restoration total to more than 7,400 acres since the project’s inception. An estimated 125 volunteers planted more than 8,200 red spruce trees in 2018 through the various volunteer efforts. But the restoration effort wasn’t always this cooperative. Saville remembers a time when red spruce conservationists were “the enemy” of the Forest Service. Back in the 1990s, the Forest Service—and the state of West Virginia—were focused on managing forests for timber and mast trees for game. Because red spruce isn’t valuable for timber or mast, it was all but removed from the landscape to make way for early successional hardwood forest. After the dirt settled, our crew of volunteers was able to lovingly reintroduce 2,500 red spruce seedlings across 10 acres of Cabin Mountain. As we drove back down Forest Road 80 toward the fertile cradle of Canaan Valley, I began to notice red spruce saplings from previous plantings—some just a few feet tall, others approaching five or six feet. Nikki and I started to see the otherwise bleak and dormant, leafless forest for something more: a tableau of a righteous scene that will be playing out for centuries to come, the retaking of Canaan Valley by the once-triumphant and dominant red spruce. Dylan Jones is publisher and editor-in-chief of Highland Outdoors, West Virginia’s only independent outdoor adventure magazine. He currently resides in Davis, West Virginia, with his partner Nikki Forrester. Dylan holds a bachelor’s degree in journalism and a master’s degree in public administration, both from West Virginia University. When he’s not hunched over his computer, you can find him hunched over his handlebars mountain biking in Canaan Valley. Editor’s Note: This story was originally published by Highland Outdoors Magazine in 2018. It has been updated with the latest numbers from CASRI on their 2018 restoration efforts. The camera wasn’t where it was supposed to be. Clad in chest waders and camouflage, Kyle Hill stepped into the pond, reached into the shallow water, and lifted it from the post where it had been mounted. “They got it pretty good,” he said. A few hundred yards away were the culprits: Rocky Mountain elk, lurking at the interface between scrubby woods and sparse grassland. Overhead, patches of clouds moved briskly across a blue November sky in southwest Virginia. The sheared ground of this former strip mine was unnaturally flat and a sharp contrast to the crinkled mountain ridges of late-autumn brown that stood layer upon layer on the horizon. The animals were slowly fading into the pine and autumn olive, leaving just one who boldly remained in the open—a large bull with antlers reaching more than three feet from its head. Hill is a senior environmental science major at the University of Virginia’s College at Wise. He was here with biology professor Wally Smith to study the impact of the elk in the area. 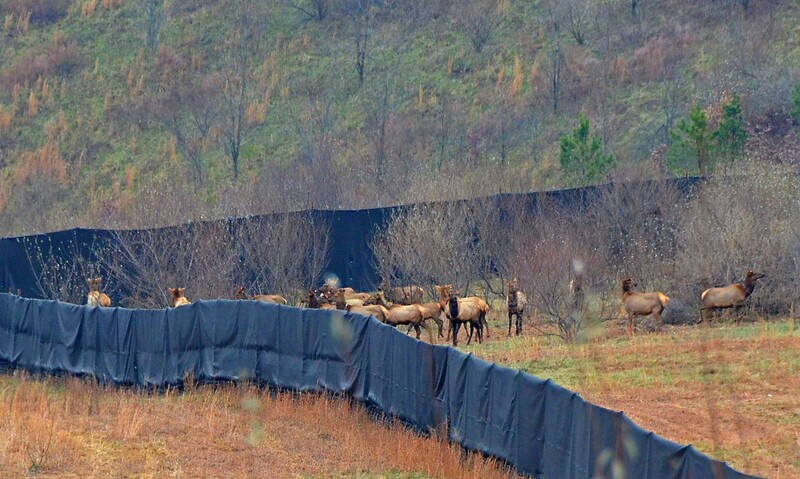 These elk are members of a herd released onto the site of a former strip mine outside the town of Grundy in Buchanan County, Virginia. They’re part of a larger population now spread across Central Appalachia, where the ungulates are at the center of a pioneering new environmental and economic landscape on the literal remnants of Central Appalachia’s coal industry. It’s the kind of habitat that elk prefer—open country, with grasses, forbs, and low shrubs, and pockets of wooded areas. Elk once were native to these mountains, but the population was driven to extinction by habitat loss and overhunting. This land has been mined by multiple companies for decades. A sign on the gated road into the property reads, “Dominion Coal Company, Mine #10.” It’s from an earlier mining operation, with underground mines burrowing deep into the earth. More recently, Paramont Coal Co. removed the mountaintop to get at the coal beneath the surface, leaving behind a flat terrain covered in grass, scrub, and pine. That’s how mountaintop-removal mining works—blowing up the top few hundred feet of mountain to expose coal seams. After the coal is stripped, mine companies are legally required to do some restoration, which usually involves replacing the exploded soil and rock—rubble—covering it with a layer of topsoil, and seeding it with anything that will hold the ground together. Even under optimal conditions, mountaintop removal severely disrupts the ecology and environmental quality of large sites. A 2016 Duke University study found the technique has left parts ofAppalachia 40 percent flatter. Central Appalachian communities are burdened with more than a million acres of these flattened mountains, many of which have been restored on the cheap. Faced with the quandary of what to do with these problematic lands, several states have used them as reintroduction sites for elk in hopes of enriching the habitat for diverse animal species. And the hopes that follow involve some economic revival in coal country from tourist dollars spent by wildlife watchers and, eventually, hunters. Guide Leon Boyd pulled up in a truck to join them. He’d been up the ridge getting a different camera back online. That tower-mounted camera streams to the Virginia Department of Game and Inland Fisheries website. Boyd is a vice president at an oil and gas drilling company in nearby Vansant who has become a local champion for elk restoration. He heads up the Southwestern Virginia Coalfields Chapter of the Rocky Mountain Elk Foundation, a group of volunteers that partners with Game and Inland Fisheries and other agencies to restore the 2,600-acre former strip mine site by seeding it with native plants, improving the soil, removing invasive species, and generally trying to create ideal wildlife habitat. Hunters were happy, and so were biologists. “We started making more open areas that had a lot of autumn olive and locust, and seeding them with orchard grasses and clovers,” Boyd said. By breaking up the otherwise forested landscape and creating ponds and other wetlands, these open grasslands attract insects, amphibians, and migratory songbirds. Wildlife restoration is just one of the new uses of about 1.5 million acres ofCentral Appalachian land affected by strip- and mountaintop-removal-mining since the 1970s. Other communities have turned their land into sites for solar energy farms, outdoor recreation hubs, industrial parks, and more. A coalition of advocacy groups recently released a list spotlighting 20 different projects at reclaimed mines in Kentucky, Ohio, Virginia, and West Virginia. Elk have proven a powerful draw for Central Appalachian communities, especially since the effort engages hunters, who have historically proven to be a powerful group when it comes to funding conservation efforts. But elk restoration also has its downsides. Many former strip mines are reclaimed with the goal of stabilizing the ground so that it doesn’t all run off with a heavy rainfall. Remnants of the rock and soil removed to expose coal are replaced with new material that’s graded and seeded, often with non­native species like autumn olive, which is known for holding soil. As a result, soil on reclaimed mine sites tends to be tightly compacted, which makes it difficult for vegetation to take root. A 2008 study published in the journal Ecological Applications found thatreclaimed mine land was poorer in nutrients, had more severe storm runoff, and resulted in major changes to vegetation, wildlife, and soil structure. Despite habitat improvement efforts by Leon Boyd and other volunteers, the landscape is covered with broom sage, a sign of poor soil fertility. One of the few running streams on-site flows out from one of the old deep mines. Yet wildlife is showing up. It’s not just elk, but songbirds, dragonflies, damselflies, bullfrogs, and waterfowl. “The main impact of elk is on the vegetation, although the development of soils and vegetation go hand in hand,” Franklin said. “Elk could improve the soil organic matter by defecating on the site, but at the same time, some studies have found that elk grazing can increase soil compaction and reduce some soil nutrients. Sometimes that habitat modification can benefit other species, as in the case of an elk wallow becoming a small wetland used by waterfowl, said David Kalb, a biologist with Virginia’s Game and Inland Fisheries department. But that activity can also disrupt local ecologies by causing erosion and transporting invasive plants. Research has confirmed that elk disturb soil in areas where they are bedding, resulting in less soil moisture, less leaf litter, and less vegetation. By disrupting the natural ecological succession toward hardwood forest, however, they’re also creating spaces for other wildlife. One reason Leon Boyd’s elk cameras are important is to get the elk herd before a worldwide audience. The camera’s accompanying website links to a public comment form for the state’s proposed 10-year elk management plan for the herd in ­Dickenson, Wise, and Buchanan counties. The plan includes guidelines for growing the elk population before opening it to hunting. Another reason for keeping the camera going: Livestreamers might eventually decide to come view the elk in person. Wildlife viewing has become a pillar in the growing outdoor recreation industry of many Central Appalachian communities in the aftermath of coal’s dominance. Elk restoration adds another attraction to the marketing of the region as an outdoor destination. “The elk viewing tours are one of about six things that we really kind of publicize as our adventure offerings, including zip line, mountain bike and e-bike rentals, whitewater rafting trips, guided adventure hikes, and rock climbing,” said Austin Bradley, superintendent at Breaks Interstate Park, which is located on the Kentucky–­Virginia state line. Breaks started offering elk-viewing tours in 2015, three years after the Virginia elk population was introduced. In 2018, about 400 people went on elk tours, Bradley said, including free trips for school groups, economic development professionals, and elected officials. “For a really long time, this park and this entire region were so heavily focused on mining,” Bradley said. “Even here at the park, the coal miners came in and ate at our restaurant, they camped at our campground, and coal companies had large employee appreciation events in the summer and Christmas parties in the winter. All that dried up. We were really getting in some pretty dire straits. Across the state line in Kentucky, elk have had an even more transformative effect on mountain economies. The Bluegrass State began studying elk reintroduction in the 1990s, released its first herds in 1997, and opened hunting in 2001. Kentucky has seen its elk population in the 16-county region grow from 1,541 introduced animals to more than 10,000. About 10 percent of the area is reclaimed and active surface mines. A 2013 study from the Kentucky Department of Fish and Wildlife Resources estimated that hunters spend $1.9 million annually in the elk region. Licenses and permits bring another $800,000. These figures don’t factor in nonconsumptive users, such as wildlife watchers. A study on five Tennessee counties where elk populations have been restored counted about $10.25 million in total economic value. As Hill and Smith set up the last of their wildlife cameras, the weather had started to turn. The temperature had dropped, and clouds coalesced overhead and started to spit cold rain. Boyd recounted hunting and wildlife-watching stories. He clearly believes in the restorative power of the elk. He described a group of birders he’d brought to the site who expected the former strip mine to look like a moonscape. At one point in time it did. But by the end of the day, he said, the most skeptical birders were the most enthusiastic, gushing about the 27 species they’d seen that day. Mason Adams wrote this article for The Dirt Issue, the Spring 2019 issue of YES! Magazine. He has covered Blue Ridge and Appalachian communities since 2001. Follow him on Twitter @MasonAtoms. This article was originally published by Yes! Magazine.